Hollybeary Creations : YNS Feb Release Sneak!! It's time for the February Release from Your Next Stamp!! Today we are kicking off our Sneak Peeks.. be sure to head over to the blog for a link to all the Design Team members blogs. 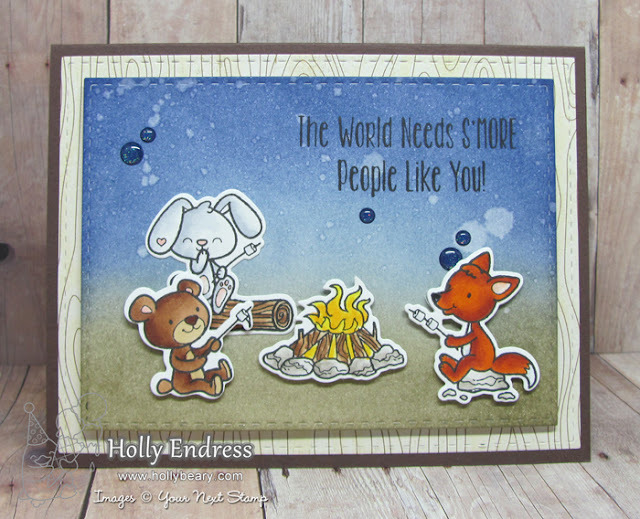 I'm sharing a card with the cute S'more Fun set and coordinating dies. 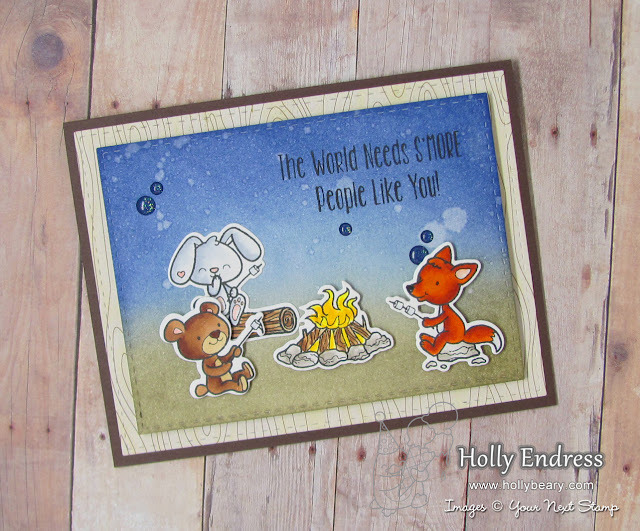 I created a background with some Distress Inks and then I stamped each of the critters form the S'more Fun set in Black Olive Ink. 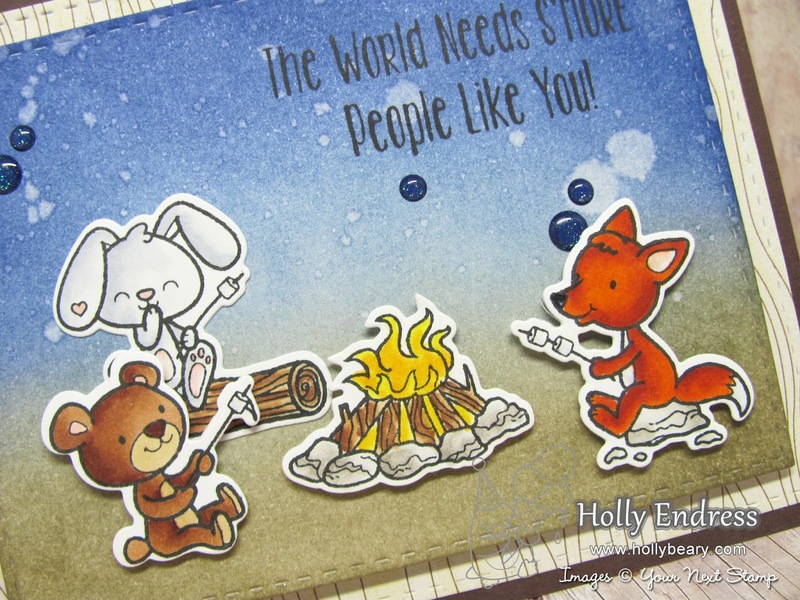 I colored them in with Copics and used the coordinating dies to cut them out. I die cut the Distressed panel and the pattern paper with the Stitched Rectangle Dies. I adhered the panels to a Chocolate Chip Card base. For some extra shimmer to the card I added some Clear Wink of Stella to parts if the images and some Blue Sapphire Glittered Gumdrops. Head over to the Blog for a complete list of all the Blogs from the Design Team. 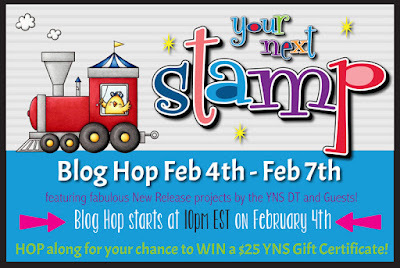 Stop back tonight at 10pm EST for the Full Release and our Blog Hop for a Chance to WIN!!! What a fun scene card. I think I'm going to like this S'more Fun set. very cute and I love the saying!!! Love the little critters! That bunny giggling is so sweet! How cute! I love this one!! So fun, what a cute scenery!